Israeli Prime Minister Benjamin Netanyahu blasted U.K. Labour Party leader Jeremy Corbyn Monday for Corbyn’s participation in a memorial for terrorists who killed 11 Israelis at the Munich Olympic Games in 1972. Pictures published by the Daily Mail show Corbyn holding a wreath next to a memorial plaque for members of the Black September Palestinian terrorist group. Corbyn's participation in the 2014 event has contributed to an imbroglio in British politics, where the Labour Party is defending itself from charges anti-Semitism, and Netanyahu said Corbyn’s actions should be condemned across the political spectrum. "The laying of a wreath by Jeremy Corbyn on the graves of the terrorist who perpetrated the Munich massacre and his comparison of Israel to the Nazis deserves unequivocal condemnation from everyone – left, right and everything in between," Netanyahu tweeted. Corbyn compared Israel’s actions in Gaza to Nazi Germany back in 2013, which the International Holocaust Remembrance Alliance (IHRA) classifies as anti-Semitic. 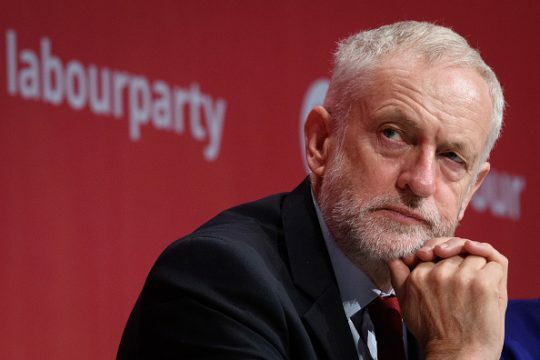 The Labour Party is currently divided on whether to pledge agreement with IHRA’s definition of anti-Semitism, which is part of an ongoing imbroglio about anti-Semitism in its ranks. Corbyn admitted to being present at the wreath-laying for "those killed in Paris in 1992," which includes to Atef Bseiso, who was involved in planning the Munich terror attack. Bseiso was assassinated in 1992 in what some claim was an Israeli operation, which Israel has denied, saying a rival Palestinian faction was responsible. The Labour leader has tried to qualify has participation in the wreath-laying by saying he was not "involved" but merely "present." "I was present when it was laid, I don't think I was actually involved in it," he said. He went on to explain that his goal was to replace to "cycle of violence" with a "cycle of dialogue" by honoring all those killed in terrorist incidents. "I was there because I want to see a fitting memorial to everyone who’s died in every terrorist incident everywhere because we have to end it. You cannot pursue peace by a cycle of violence, the only way you pursue peace is a cycle of dialogue," Corbyn said. Labour MP Luciana Berger said Corbyn’s explanation is not satisfactory. "Being ‘present' is the same as being involved. When I attend a memorial, my presence alone, whether I lay a wreath or not, demonstrates my association and support," she said. "There can never be a ‘fitting memorial' for terrorists. Where is the apology?" Labour initially tried to manage the scandal by saying Corbyn participated in a wreath-laying for those killed at a PLO base in Tunisia back in 1985, but the photos show otherwise. The memorials for the 1992 incident and and the 1985 death of Palestinians in Tunisia are about 15 yards apart at the cemetery. The later, however, is in a different part of the complex, and the Daily Mail noted Corbyn is pictured in front of a plaque that lies beside the graves of Black September members. Additionally, Corbyn himself wrote in 2014 that he was there when "wreaths were laid at the graves of those who died on that day and on the graves of others killed by Mossad agents in Paris in 1991." The reference to 1991 appears to be a typo in reference to the 1992 death. This entry was posted in Issues and tagged Anti-Semitism, Benjamin Netanyahu, United Kingdom. Bookmark the permalink.